You are not logged in. [Log In] ETS Forums » Forums » The Survival Forum » The Survival Forum » So, is Wiggy's just plain "wiggy?" My mistake; I should have explained by 'translates' i mean what it costs in dollars not the exchange rate. You want to pay over 2 dollars a litre for petrol; come here! What we can buy for a pound here, usually costs a dollar in the US. I think the bivy so far is the best I've found so far for protecting down. I'm experimenting with a OR MicroNight Bivy and I'm thinking it's not completely waterproof from the comments from many people from different forums, The consensus says that it can take some light water but not a full storm and recommend a tarp or poncho over top. It's a very compact and light bivy and it definitely makes the temp rating increase (probably by 10 degrees) but I haven't field tested it yet but I look forward to see how it handles in a hard cold rainstorm. It all depends on WHY someone wants a waterproof bag. If it's to camp without a tent, then you do need a tent substitute. If it's because you are afraid your sleeping bag will get wet inside your tent. Then a bivouac or poncho would be of no help. But really, if you keep your bag inside a waterproof sac, only open it inside the tent and don't wear wet clothes in it and why should it get wet? If it does you need a better tent not a waterproof sleeping bag. Combined this with an 800 gram British Army Goretex Bivi and a 700 gram Alpkit Airic self inflating pad and you have a very effective sleep system weighing around 3.6Kg 8lbs which is waterproof and usable down to temperatures below -15C for around £100 $200). Thanks for the offer Am_Fear_Liath_Mor, but I'm happy with my WM bag, I was just looking for a field tested light weight bivy that could handle severe rain. I got the bag that I love with the capabilities it has, I just want something that would protect the bag from the rain in a hard storm in the event of a tent failure. "It all depends on WHY someone wants a waterproof bag." I use a water proof bag for everything from river crossings, canoeing, put my bag on a boat or what have you. And when I'm not using the bag to hold a sleeping bag, I use it diving as well with emergency equipment on board. "If it's to camp without a tent, then you do need a tent substitute." I have a old north face tent breach water through after camping in 38 degree weather and raining 24 hours a day for several days. The tent did great as long as it could but the continuing rain started to flood the bottom of the tent and soaked my synthetic bag at the time, also dripping from the ceiling as well. With the rain and cold it took days for that bag to completely dry and if it was down it would be worse. I gave the tent great credit for what it went through and I had scotch guarded and seam sealed the heck out of it (both before and after). I just wanted something so if I have another breach I would have a second line of defense. In hind site, I should have dug a trench around the tent, so a lot of the flooding was poor preparation on my part (and I was on higher ground, just not high enough). "If it's because you are afraid your sleeping bag will get wet inside your tent. Then a bivouac or poncho would be of no help. But really, if you keep your bag inside a waterproof sac, only open it inside the tent and don't wear wet clothes in it and why should it get wet? If it does you need a better tent not a waterproof sleeping bag. The light weight bivy I will be experimenting with, a few people had said it could not take a rain storm for a long time on the top of the fabric for long storms but light rain was ok. They mentioned a tarp or poncho would be better if used to divert most of the rain off the top. The whole idea of the bivy for me is a emergency shelter and a secondary line of defense if I had a tent failure. With this scheme, I cut down about 4.5 to 5 lbs from the 8 lbs or so sleep system you describe above. For a pad, I'd use two Ridgerest Short closed cell pads, one of which would be cut down to only 28" and placed under the non-modified Ridgerest. This would give me extra padding in the crucial areas. This configuration would be good down to about 32F/0C, although I'd probably want to switch to a Ridgerest Regular as I approached 0C which would add another 5 ounces. This set up still saves me about three pounds over the Pattern 58 set up. Not saying the Pattern 58 is a bad idea! I'm just always looking for ways to save weight so I can keep my pack light enough that I can still be agile. Too heavy gear can actually make one less safe if it contributes to a knee injury, a fall, or the like. I'm late to the thread, but here's my $0.02. I owned a Wiggy's overbag, I believe was rated to 35*. The bag was well made, the temperature rating was within reason and by sheer luck the zippers mated to my REI polarguard bag. I was able to nest the two bags together for winter use just as if I had a second Wiggy's bag. The overbag did what I wanted it to do, that is, keep me warm in the summer and extend the range of my REI bag in the winter. I never got the bag wet. Along the way I discovered ebay, took a chance on a down bag and never looked back. I sold the REI and Wiggy's bags on ebay and now have several down bags of various temperature ratings from 20 to minus 20. All my down bags are from ebay and at least 25 years old and in great shape and very well made. The insulation in Wiggy's bags seems to be durable, I think it's basically old school polarguard. The newer polarguard seems to have sacrificed some durability for weight savings, depending upon your point of view the trade off may be worth it. For me, down is more comfortable to sleep in, packs smaller and weighs less. In spite of the cold when wet issue, I have not slept in a wet sleeping bag, down or synthetic, in over 30 years. In my opinion, there is nothing wrong with Wiggy's products. Compared to other synthetics they are heavy for their temperature rating, but for example they do use a number 10 tooth zipper and few other companies do that anymore. There is no free lunch here, everything is a tradeoff of warmth, weight, cost, quality, you have to choose which criteria you are most intested in maximizing. If you choose Wiggy's the quality is fine, but you'll have to balance out the remaining variables as they pertain to your needs. All my down bags are from ebay and at least 25 years old and in great shape and very well made. 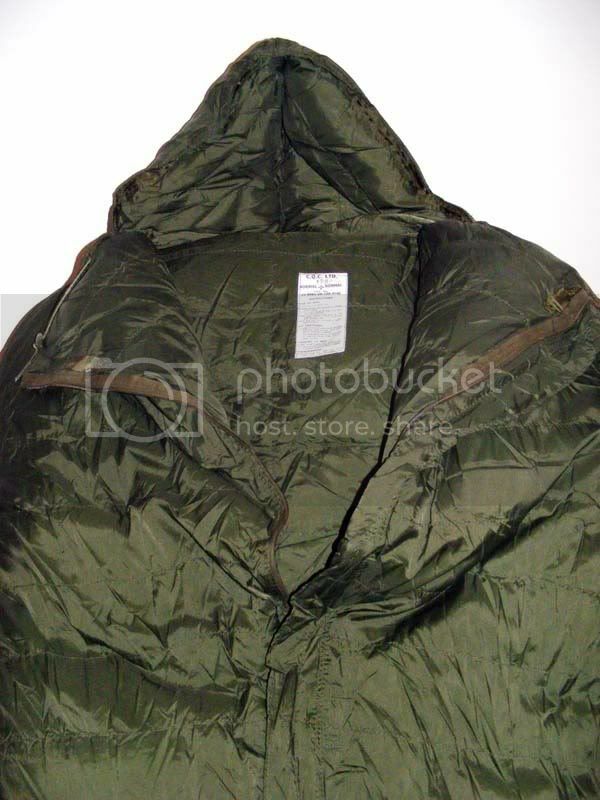 Just had delivered today a new unissued 28 year old 58 Pattern Sleeping bag. Here are some of my initial impressions. First impressions are that its huge, quite bulky and somewhat heavy compared to the very lightest down bags rated at the same temperature. It has a NSN stock number 8465-99-120-8198 and is manufactured by C.Q.C Ltd. The specification is similar to the one described here at http://www.cqc.co.uk/militarysleepingbagcqc11.asp but is lighter at 2.3 Kg than the 2.7Kg specification on the manufacturers website (2.1 Kg in the first post was over optimistic) because it uses down/feathers mix instead of synthetic polyester filling now specified. Considering the age of the bag, it seemed to loft back to a thick insulation layer after a shake out. It really shows just how durable down is and how well it keeps its insulation qualities with age. The 58 Pattern bag is huge, much wider than conventional bags being at least 5-6 inches wider at the shoulder. It is a semi-rectangular shape rather than being a full mummy shape. Some of the ultalightweight bags can be a little restrictive in terms of comfort because of their shape and sizing. It also appears to be much more robust due to the outer fabrics used. The base of the bag uses a waterproof, impermeable polyurethane coated nylon with the top of the bag being manufactured using a simple Nylon taffeta. I would have to say that the bag doesn't have the same luxurious silky softness feel to it in terms of the quality of the materials Snugpak uses for their softie range but it is perfectly acceptable. The quality of the down doesn't appear be top notch quality 700 or 800 fill down but would be around the 500-600 fill power in terms of loft i.e. entry level basic down/feather mix. The base of the bag has a very generous fill of down/feathers. The bag has possibly been designed to be used without a pad (or at least with a lightweight NATO Sleep Mat http://www.surplusandadventure.com/shopscr3028.html ). This would of course reduce the temperature range the bag can be used. A separate ground sheet wouldn't be required as the bag has already a waterproof base. The bag has the ability to be used in conjunction with a just a Basha or Poncho to keep the rain off. A bivvy would certainly also increase the bags weather protection, but this would have to be a MVP type considering the bags water impermeable base construction. The bag comes equipped with toggles and loops at the top, middle and bottom of the bag. This helps to allow the bag to folded and therefore helps with packing the bag into its attached waterproof bag at the head. This alows reasonably quick packing. The 58 sleeping bag does not have compression straps and this makes the bag appear quite bulky once packed up. I would say it was about the same size of an equivalent 2 Kg synthetic bag when stuffed. A compression bag would probably reduce the size to about half its current size. The 58 Pattern sleeping bag should make a good bag to store in the back of a vehicle for emergencies. Its certainly not the lightest or the most compact sleeping bag but then again there are still only a few synthetics which can match its performance in terms of bulk, temperature rating and weight. Oh its really cheap as well so I'm going to use some of that Nikwax Down proof on it as an experiment to see how well it holds up in damp and wet conditions.